Andrea's World Reviews: Pirate's Booty review and GIVEAWAY! The snack table is the holiday hot spot at parties! Make this year a little healthier by swapping out greasy fried potato chips or sugar-laden sweets for baked, all-natural Pirate’s Booty. 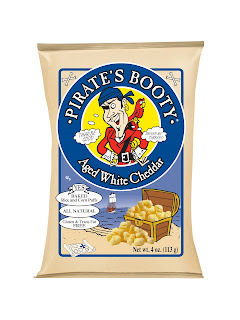 Pirate’s Booty has half the fat and fewer calories than regular fried potato chips and less fat and fewer calories than traditional candy (plus zero grams of sugar). Also, Pirate’s Booty is gluten, peanut and tree-nut free, so it’s great for guests with these common food allergies. 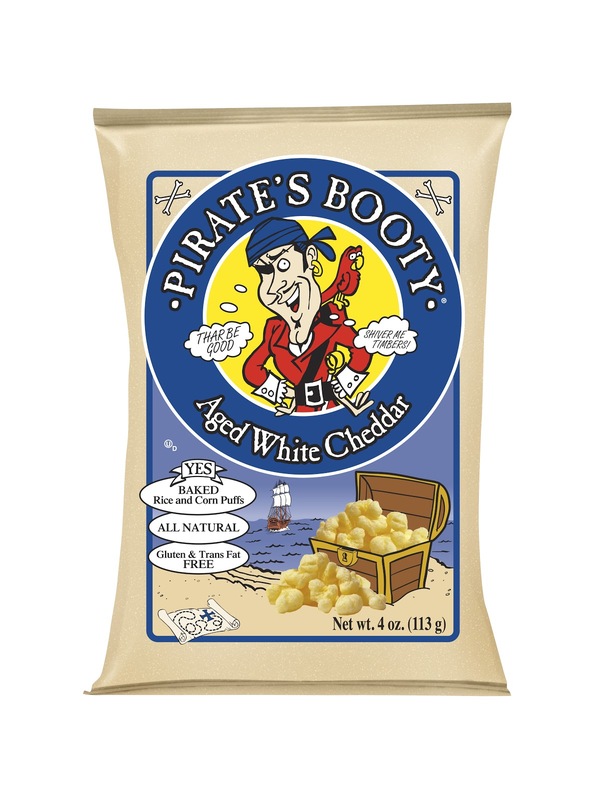 Pirate’s Booty is also made without trans-fats and ingredients you can’t pronounce. Pirate’s Booty is available at a retailer near you in family-friendly sizes and convenient multipacks! We love Pirate's Booty. We devoured the entire case within a week. My son is autistic and VERY picky about what he will eat. Most foods he will not even allow near him, let alone taste, but he ate these right up. He likes popcorn, so I know he would like these, but I was worried he would not give them a chance since they were new to him, but he dove right in. I don't know if it was the bag design(he loves pirates) or the goodies that came along or the look of the product itself that made him decide to try Pirate's Booty. But whatever the reason, we are both glad he did. I was able to send Pirate's Booty with him in his lunch(which usually consist of 2 of the following(one meat and one non): rolls, chicken nuggets, pre-cooked bacon or goldfish crackers) The teacher was really surprised when he ate Pirate's Booty at school and asked me what it was. My husband loves Pirate's Booty too, and had replaced his usual potato chips with it(until we ran out). That really made me happy since he is not a one serving kinda guy and even one serving of potato chips is not very good. Even my 14 month old munched on Pirate's Booty. She usually has to try whatever anyone has, but she only actually eats some things. This is something she ate multiple times, even kind of asking for it(by grabbing the bag and saying "a yah"-meaning yes). And of course I love this. I used to eat the same style of product(kernel-less popcorn) when I was a kid, and I loved it then, but Pirate's Booty is WAY better. I guess there is one thing I don't like about Pirate's Booty. It runs out. That's it, there is nothing else negative to speak of. The kids love Pirate's Booty so much, they wanted to form a fan club. If you want to join the Pirate's Booty Fan Club too. Just enter the rafflecopter below and you will have the chance to win a case for yourself. That is all it will take to make you a (Pirate's) Booty Hunter for life. Good luck Matey. Arrrrr! I love Pirates Booty! Thanks for the giveaway!